Every month, you’ll find a new PLR catalog offered from this page, which makes it easy for you to pick your titles and order your PLR packages, quicker. The catalog is especially handy if you prefer to browse our PLR offerings offline, rather than online. It’s currently separated according to categories, with a listing of each PLR title underneath the appropriate section. 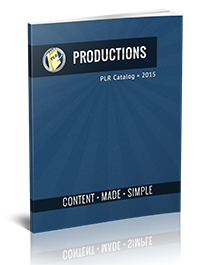 As we add new PLR products to the store, we will update your PLR catalog. To save the current PLR catalog to your hard drive, right click your mouse over top the link and choose “Save Link As” to copy the PDF catalog to your computer.